Until the FIFA World Cup 2022 takes place, one of the most modern metro systems in the world is to be built in the Qatari capital of Doha. The Doha Metro is part of an extensive overall rail plan of the Emirate of Qatar. PTV consultants use risk analyses and scientific research on fire and evacuation simulation to eliminate weak points in a tunnel and optimise rescue measures. The new Metro system will largely run underground in the centre of the metropolis. On behalf of Siemens AG, the PTV consultants carried out an analysis of various possibilities for temperature regulation in the tunnels. Construction of the Doha Metro will be divided into two project phases: Three of the four lines and 37 stations are to be completed by 2020, i.e. before the Football World Cup in 2022. The second phase comprises introduction of an additional line and expansion of the existing line with over 60 additional stations. To ensure that all vehicle and infrastructure system components function reliably in operation, the customer requires that the temperature in the tunnel does not exceed 55°C. In Doha, however, outside temperatures can reach up to 50° Celsius in summer. With the additional heat released by the vehicle's own electrical components and air conditioning systems, there were concerns that this requirement might not always be met. Initial calculations were based on the assumption that under certain conditions temperatures of approx. 62°C could occur during operation. Various solutions have therefore been developed, including an active cooling system for the tunnels. PTV Transport Consult analysed extensive CFD calculations (numerical fluid mechanics, computational fluid dynamics) to determine the effects of different approaches on the ventilation in the event of cooling and fire. 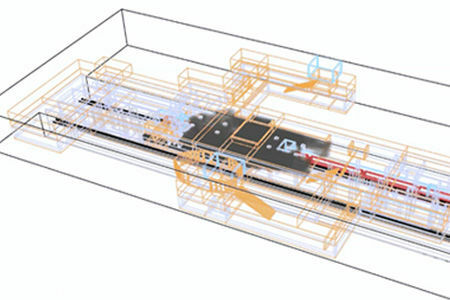 For this purpose, individual metro stations and the variants of tunnel ventilation systems, including the connected tunnel tubes, were mapped in detail in a 3D model.